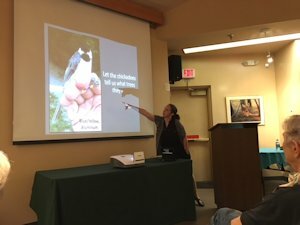 Dr. Desiree Narango, an ecologist, gave a presentation to 70 people on September 12, 2018, explaining how native and non-native plants affect breeding bird populations, behavior and food web interactions. She worked with the Smithsonian Institution's Neighborhood Nestwatch program which focuses on breeding birds in urban/suburban backyards. Like most songbirds, Carolina chickadees are very dependent on caterpillars and other insects when raising their young. 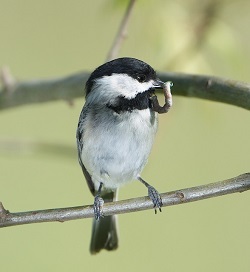 A chickadee with four to seven young, needs between 390 to 570 caterpillars every day to feed their young. Caterpillars are very dependent on certain host plants. Native plants support a higher abundance and biomass of caterpillars than non-native plants. Globally, more than 90 percent of caterpillars are “specialists,” meaning that they use one or a few plants as host plants. For example, the zebra swallowtail butterfly only uses the pawpaw tree. Virginia has 2,529 caterpillar species. Of those, 41 percent only feed on one plant. 70 percent feed on fewer than five plants. At least 518 caterpillar species use native oak trees in Virginia. For gingko trees, a non-native, only several; bamboo, one; zelkova, zero. A few native plants are disproportionately important for the caterpillars that birds eat (oaks, willows, cherries, poplars, pines). If non-native plants are abundant, chickadees are less likely to be present, less likely to breed, lay fewer eggs and fledge fewer young than chickadees in habitats with native plants. Non-native trees provide less food for migrating birds than native trees. Chickadees are more likely to successfully raise their young if no more than 30 percent of plants are non-native. The average non-native biomass in Narango's study in the Washington, D. C., metro area was about 55 percent. Dr. Narango's presentation included many photos and statistical charts. Photo by Katherine Wychulis Native plants provide food for many birds like Carolina chickadees. Photo by Doug TallamyShe challenged attendees, saying, "Your yard can have profound implications on the songbirds and other wildlife that use urban and sububan areas.” This photo of a chickadee with a caterpillar is by University of Delaware entomologist Dr. Doug Tallamy, with whom Dr. Narango studied and still works. She is now at the University of Massachusetts, Amherst.